I own seven boat lifts. I like the aluminum cantilever style as I live on a shallow lake. Cantilever lifts go lower than vertical lifts generally, they are easier to repair and usually less expensive to purchase new or used. 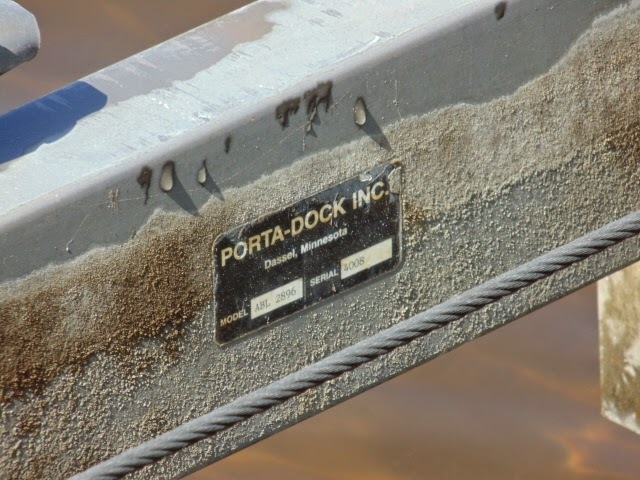 Four of them are Port-a-Lift by Port-a-Dock. I bought them all used finding most on CraigsList. Two have bunks and two have the standard boat support system. The longer bunks support the boat better and also seem to be easier to keep the boat level on the lift. One has a canopy. Two have 2000 lbs capacity (for 17.6's) and two have 2600 lbs capacity (20' models with one engine). The most notable difference of the two different capacity lifts are the winches. The Hydrodyne on the left is my friend's 1989 and my 1987 is on the canopy lift. We float all the lifts into place during the spring and winch them out in the fall after loosing them from the sandy bottom with a big mechanical jack. The same jacks I use to level the docks. It is about 36" to 40" at the end of my dock. We sit or hop off the dock and ski away with standard length water ski ropes. The width of the bunks should be about the same as the boat trailer bunks. If possible I like the bow of the boat a little higher than the stern so the water drains out easier. 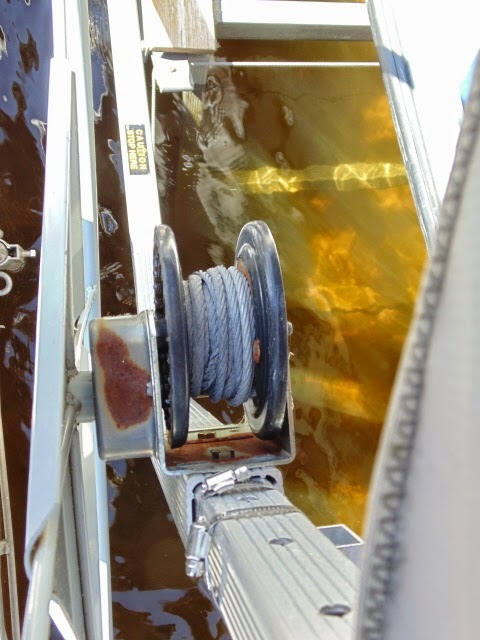 The bilge pump won't empty the bilge completely on most boats. I take the plug out when the boat is on the lift after we are done skiing. 2600 lbs lift with full length bunks. Often times the winch is bigger on the higher capacity lifts while the aluminum frame and bracing looks to be the same size. 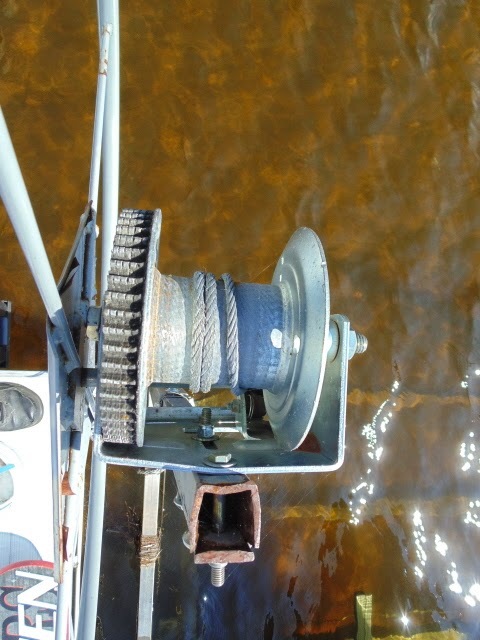 Below is the winch on a 2000 lbs capacity lift. Below is the 2600 lbs lift winch. I have added treated lumber deck boards to my lifts. They run the full length of the lift. It is a cheap sort of safety step. I would not suggest putting a great deal of weight on the area as it isn't designed as a load bearing surface according to the manufacturers. 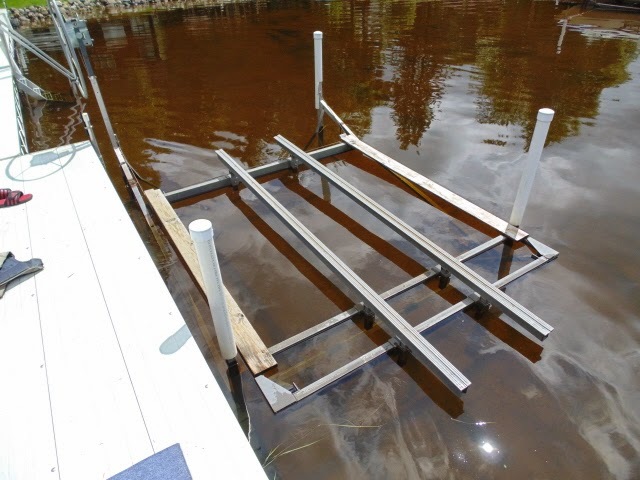 The single board makes it hard to fall between the dock and the boat. Boat covers are not water proof but they keep most of the water out of the boat though which is why my boat has a cover and canopy. WARNING: A canopy can turn into a sail so when the boat is not on the lift a good wind may move the lift along ways. I install my canopy on the lift after the boat is in the lake for the ski season. I remove it when the boat is taken out in the late fall. 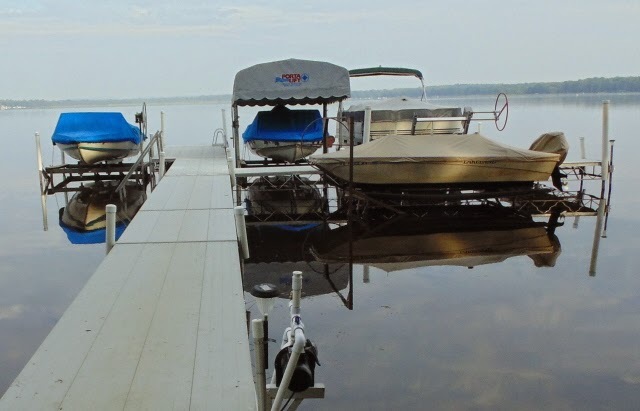 Installation tip: It is easier to stand on the boat raised up on the lift and install the cover than any other way I have tried. 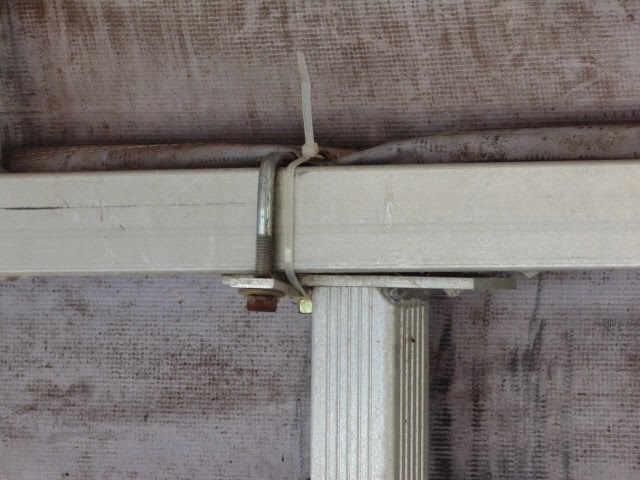 I use plastic wire ties to secure the canopy to the frame. I tend to lose the re-useable ones. If you are looking at used lifts there often is a capacity sticker or model number on them. This is a 2600 lbs lift with the standard boat support system. The covers for the aluminum lift poles are 3" PVC pipe with covers. I use them on my dock poles also. I notch the bottoms on some of them so they can hang down further than the dock would allow. My docks are all roll in docks. They all have 3 sets of wheels. One set of wheels is on the shore end and they all have hinged 8' ramps. One dock is home made, one dock is an expensive store bought one and the 3rd is a used dock that was a great deal from a dealer that he took in trade. My shore line has a gentle slope to the water so I can wheel the docks all straight in and out making weight not much of a concern. 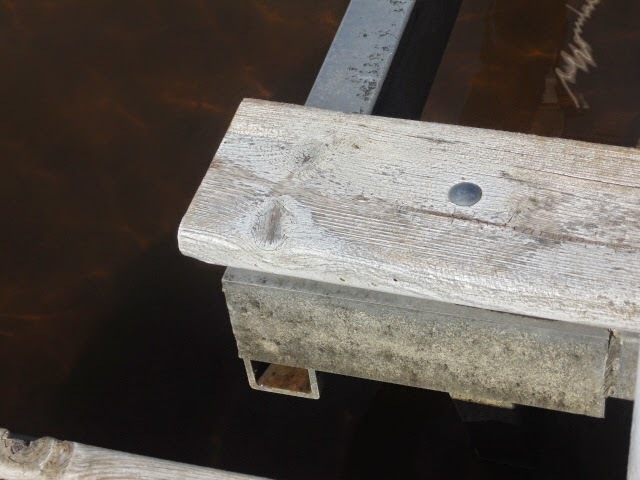 Docks are all hinged in the middle so less stress is placed on the bolted together sections of dock. 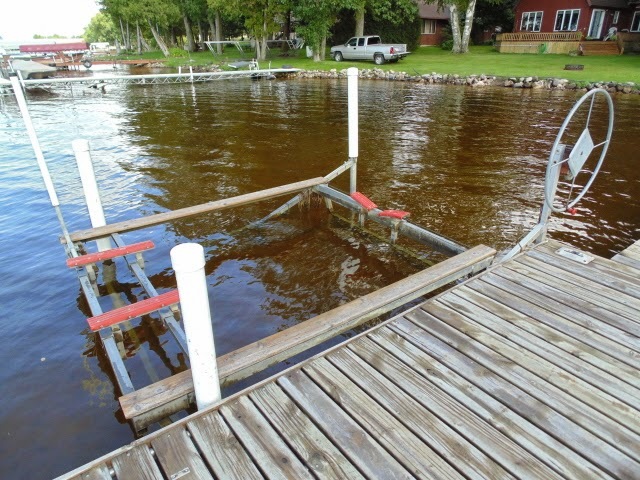 The bigger dock with the slips the wing docks unbolt and wheel in to shore. I'll do an article on docks if enough people ask.